The SUP (Stand Up Paddle) distance record is now 238 miles. 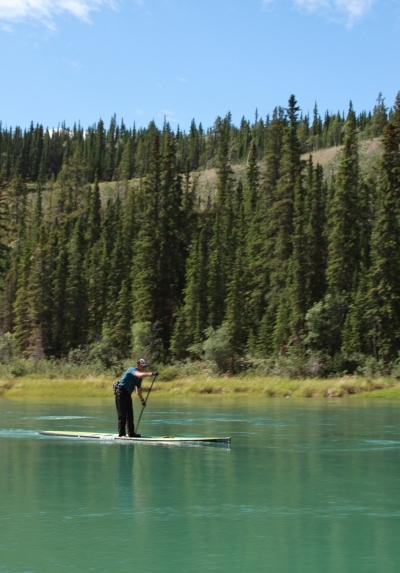 The record was set on June 27, 2012 on the Yukon River in Canada. Ben Friberg began his quest near the time of the Summer Solstice to provide him with plenty of daylight. The water level was high and the weather was good. Friberg wore 3 GPS devices to record his paddle. He stopped essentially non-stop, with breaks to change out his hydration packs and for quick snacks. He traveled at a 10mph moving average. Friberg had a support boat with a crew of four. Friberg is 34 years-old, from Chattanooga, TN. He prepared for this record paddle “somewhere between 8 and 10 months“. The board he used was an 18 foot carbon Riviera 404. This was the board Danny Ching (professional SUP racer) used when he won the Battle of the Paddle race last year. Friberg has been paddling for four years.